“Ok, come, no problem!” he says, hoisting our bags onto the roof. “Teşekkür ederim!” we say, climbing in and grinning at the bus full of passengers, who murmur greetings to us. I slide past the legs and bags, past a man holding a baby on his lap, and squash myself into an available seat. A dolmuş (“doll-mush”) is a small shared minibus. The name means, literally, stuffed. This one had stopped as I tried to flag down the car behind it on the highway to Iğdır, just outside Kars. We turn off the main road some forty-five minutes later. I ask the driver to stop, but he makes some hand signals, indicating he’s going further on our way. We grind over potholed roads to the centre of the small town, where most of the passengers climb out. “Gel!” The man I’ve been chatting to beckons me to follow him. I look at the driver. “No,” he says, and says something to the man that I don’t quite catch. We stay on the bus. The last passengers get out. We drive down a narrow road and into an empty car park, away from the road. Now I see something change in the eyes of the driver. He invites us for tea, but I no longer trust him. I decline as politely as possible and ask for our luggage, still strapped on top of the dolmuş. “Fifteen lira,” he says, holding out his hand, smirking. His face hardens further and I see that it’s futile. I open my wallet. Fortunately, the only thing visible is a ten lira note. I hand this to the driver and he climbs up to retrieve our luggage. “Turkey, no otostop!” he yells triumphantly as we haul our bags back to the edge of town. I feel tears welling up. Everything seems suddenly futile. What the hell are we doing here, anyway? 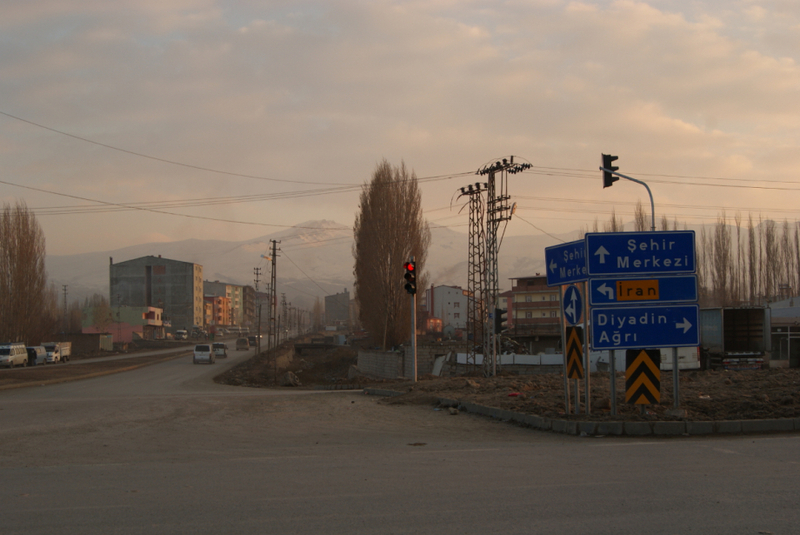 “Here” is a tiny town named Digor, close to Turkey’s eastern border. Rather than taking the direct route across Anatolia, we’ve decided to take the longest, skirting the edges of Armenia, Iran and Syria. I’ve never seen this road, and I know it will be beautiful. We stand in the dust for some time before a truck pulls in. He’s going to Nakhichevan, the Azerbaijan enclave sandwiched between Armenia and Iran. This driver has a gruff kind of no-frills friendliness that I appreciate. Russian music fills the truck as we trundle along. He points out the Armenian villages on the other side of the border, almost within touching distance, bright blue eyes flashing out from his sunglasses. He drops us at Iğdır, and we decline an invitation for tea. The sun is setting fast. The faint trace of a mountain rises behind the buildings at the edge of town. 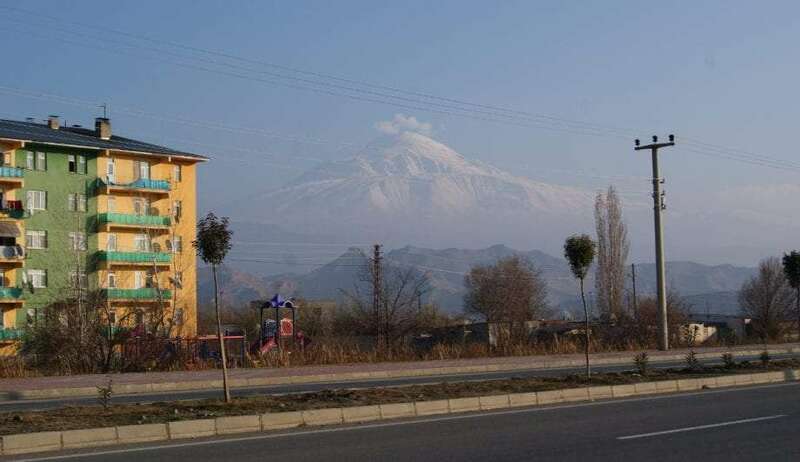 The official Turkish name for the mountain is Ağrı Dağı – Strong Mountain – but everyone we meet uses its older name, Ararat. Two years earlier my friend Halil was giving me a ride to Hopa, close to the Georgian border. We stopped to collect a girl from a seemingly random petrol station. Her name was Kasia, and she told me she was living in Yerevan. It would be difficult to convey the extent of my surprise. Although Turkey and Armenia share a border, they’re completely divided. “What brought you to Turkey?” I had asked, suddenly intrigued by this creature sitting next to me. “I dreamt that I saw Ararat from the other side,” she said. 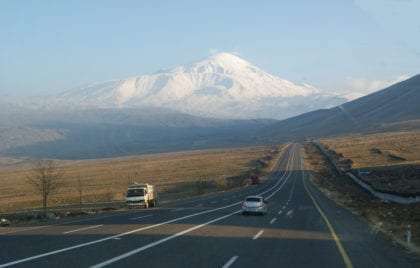 Now here we are, the other side of Ararat. I remember Kasia and wonder if this is how the vision in her dream appeared, and if she found whatever was calling her. Across that snowy peak lies Armenia, a land we travelled from not long ago. I think of the bustling bars and cafes, the women click-clacking their heels down Yerevan‘s main shopping streets, another world away from this dusty highway. There’s an intensely mystical quality to the hazy outline of the giant in front of us. The road unrolls like a ribbon that seems to disappear into its depths. The truck taking us to Doğubeyazıt is heading through Iran – now just a couple of kilometres away – and on to Turkmenistan. It’s going to take another fifteen days, and he’s already driven all the way from Istanbul. I ask if he has a family, but he just brushes his hands together. “Family finished now,” he says. Doğubeyazıt is one of the least beautiful cities I have ever seen. It’s late December and cold. Overladen mules limp along the main road among smoggy cars, dust, and growling mopeds. Small packs of children follow us, jaunting and taunting. We need to sleep somewhere, and wild camping is out of the question. 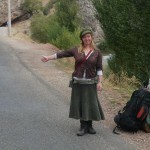 I leave Hrach with our packs in a tiny park and go in search of internet. The road is a long and seemingly endless line of hardware shops, phone shops, and dimly lit tea bars filled with old men clutching tulip glasses and cigarettes. Everyone seems bored, and I don’t blame them. The city is as far from Istanbul as is possible in Turkey, in every conceivable way. It seems the Turkish government has forgotten this corner of the country entirely. “How much?” I ask in Turkish. “Very cheap!” he announces. He begins writing numbers on a napkin. It’s a bit pricier than I imagined. “Ah! Hitchhiking.” He thinks about this for a moment. “I will make you a sale,” he tells me, crossing out the previous number and writing a lower one. Our hotel room has a double bed, a single bed, and an en suite bathroom with hot running water. I sprawl on the bed and grin.